There was a clear foreward pass, look at the lines in the grass, the first pass was behind the lighter green and was caught a good 2 feet into it! But I thought Leinster were great, although our pack dominated for most of the game leinster took their chances and deserved the win! Great try. Made a bit of a mockery on the defence. A nice try .. all in the timing. anonymous .. The first pass is a close call but the ball is allowed to float forward with the passer's momentum as long as the initial ball movement is flat. It always looks worse when the passer is hit at the same time and stops dead or goes backwards as he does here, but the pass can still be OK. If you're interested there's a Youtube video called "rugby union forward pass" that goes through this pretty well. anyone see nikki walkers try at the end?? give that man space and hes unstoppable!!!! Good game and good try. Ospreys seemed to dominate the first half but it was mostly leinster second half, ospreys just didn't take their chances so leinster deserved the win. It would have been harsh for ospreys to have come away with nothing so they deserved their last gasp try and conversion. Also very impressed with the crowd, leinster are by far the best supported team in the league. contepomi it's great, what happen with d'arcy??? Yeh that last pass was a forward pass imo, but good play regardless. I agree with the anon poster above. A backline of Earles, Fitzgerald and Kearney will be unreal for Ireland! We lost but not to bad i guess, we were missing players, and to go away to Dublin and play the champions and come away with a point is ok for me. We may have dominated but we were clueless ball i hand, Leinster defiantly deserved it. Contepomi; Carter; Hernandez; Gratest rugby players of the world since 2006.
damn that was a good try. 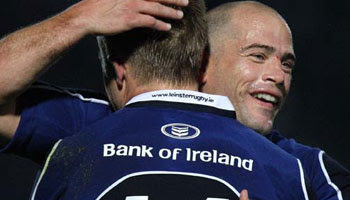 earls is yet to play a heineken cup game or even a game against decent opposition so lets not get carried away.